Scenario planning is a productive thought experiment that combines science fiction and fact to help you cope with the exponential changes happening now and in the foreseeable future. 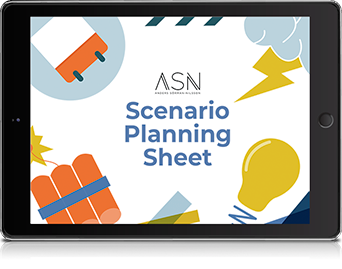 To help you effectively map out and visualise scenario planning, we’re providing you with this scenario planning sheet. Identify your top two most disruptive Drivers of Change (choose from sociocultural, technological, economic, environmental and political) and plot them on an x- and y-axis on the sheet to envision four alternative future worlds. The result will enable you to make better and more informed decisions when it comes to the steps you’ll be taking next. Be the science fiction author and creative genius of your life. Start designing a better tomorrow for yourself, and always remember that great things await those who think forward and ahead.